For about ten hours yesterday, on our nation's holiday, Knicks fans thought they had bagged themselves a Canadian. After having been thwarted by the Toronto Raptors in their attempts to trade Landry Fields for Nash in a sign-and-trade, they had decided to add Iman Shumpert to the package. It looked like a deal was gonna go through. And then, right before all the fireworks started last night ... here came those damn Lakers. The deal went through as a little gut punch to Knicks fans dreaming of a Nash and Jeremy Lin point guard combo; the Suns sent Nash to the Lakers for two first-round picks and two second-round picks. Now, we personally don't quite understand why that package — which will basically be four lower-level picks — is better than Iman Shumpert, but Nash apparently wanted to be closer to his kids in Phoenix, leading for him to push for that package. (So much for him preferring the Chinatown soccer.) So Nash is now a member of the Suns' hated rivals, and the Knicks now finally accept that their Nash dreams are over. It feels like they've been begging him to play here for a decade now. So, we ask with a metaphorically raised eyebrow, is this necessarily so bad? 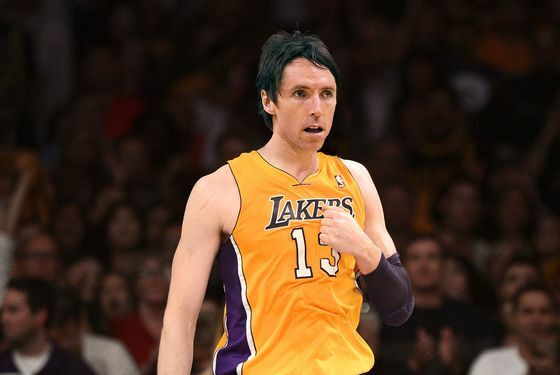 Sure, Nash would have been fun, but everybody cheer up. Nash had some significant downsides. We are far from certain the Knicks staff would have kept him as ageless as the (universally celebrated) Suns staff would have. He would have had the same fights with Carmelo Anthony about who controls the ball as Jeremy Lin did (and will). He would have been hugely expensive at the age of 41. (41! A point guard!) But for our money, the best reason to feel better about not acquiring Nash is Iman Shumpert. Shumpert has something the Knicks don't have pretty much anywhere else: youth and upside. Sure, he'll be recovering from his knee injury for a while, but there's no reason to think his explosiveness and defensive prowess will be diminished at all when he returns. Had Nash come here, basically, the Knicks would have been asking Tyson Chandler to guard all five guys. Nash wouldn't have been as perfect an offensive fit as we wanted him to be, and on defense, well, even before he was in his late thirties, his defense was lacking. It would have been fun. But, to our minds, Shumpert was too much to give up. We find it a relief that he's still here. All right then: What next? Well, first thing is taking care of the Lin situation. Last night, the Houston Rockets — the team that last released Lin so the Knicks could grab him — gave Lin a big offer, one expected to have the same "poison pill" salary escalation that the Raptors gave Landry Fields. (A deal, now that they've lost Nash, they have to be seriously regretting.) The Knicks are expected to match whatever the Rockets offer, something that was likely even if the Nash trade had happened and is almost certain now. Jim Dolan, for all his faults (and, uh, he has a few), has never been afraid of paying a luxury tax, which he'll be paying a ton of during the third and fourth years of Lin's theoretical deal. It'll be steep, but it's tough to argue Lin won't more than earn that back off the court. On the court? Well, no one's bigger believers in Lin than we are, but the Knicks would be putting quite a bet on a guy who has played about 25 excellent games, particularly now with no Nash to fall back on. As Alan Hahn pointed out last night, the Knicks still have $6 million in sign-and-trade money — in a trade that would not include Shumpert — that they can use, and many people think they'll go after the Lakers' Ramon Sessions. That still leaves them plenty short, however, on shooting guards. (What's up with J.R. Smith again?) It's also possible Lin might not sign the Rockets' offer sheet, though if we were him, we'd call the Knicks' bluff. The Knicks still have plenty of options and plenty of backcourt spots to fill. One of them won't be filled by Steve Nash, though. That might not feel great on opening night later this year ... but when Iman Shumpert's healthy and ferocious in 2014, and Nash is Jason Kidd with a better shot, we bet you'll feel a lot better about missing out yesterday. Patience, grasshoppers.